How do I sell PIN products? Each product in our API contains a redemption mechanism. This is either “Immediate” or “ReadReceipt”. PIN products are of the “ReadReceipt” type. The information you must provide to your customer will be available in the “ReceiptText” which is part of the SendTransfer response. What is the default account number for PINs? I am an existing partner in a previous API version, can I upgrade? What are the implications? All versions of the API connect to the same system. Your account credentials, products, discounts etc. will remain the same. All your transactions (regardless of the API version) will be included in any report or invoice. Previous API versions may not have the same products supported. When you are in UAT mode (before going Live) you use the UAT test numbers. When you are in Live mode you can still test with the UAT success numbers you can find in getProducts response (UatNumber field). These numbers always return success and will not deduct anything from your balance. Can the min and max send values be changed? Typically, they cannot be changed but certain cases can be made from time to time. Is there a test account/server? There are no test accounts. 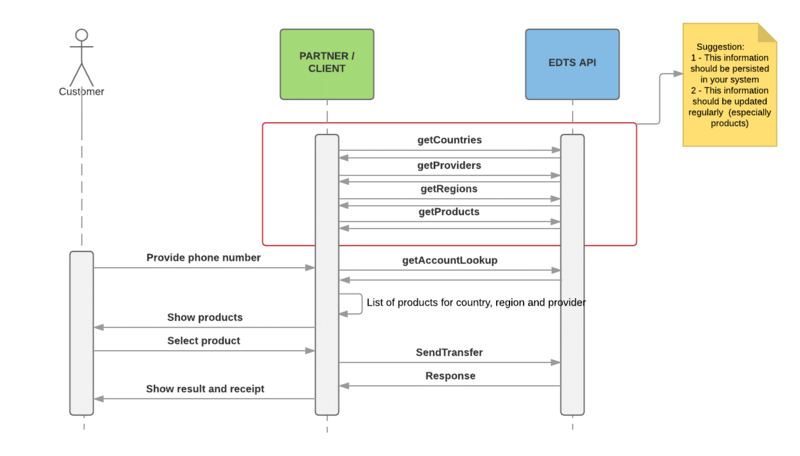 Testing can be accomplished by sending UAT transactions as described above in question 4. What is the difference between validateOnly:True and validateOnly:False? ValidateOnly is True it only checks if the syntax are correct and if the user has enough balance, it never deducts from the balance. When it is set to false, money is deducted from the balance and a top up is sent as well as the successful response if no errors occur. What is the purpose of the parameters named "Settings" and "DistributorRef"? Some products declare SettingDefintions that mandate name-value pairs that can be submitted with the transfer and will be passed to the Provider. Distributors can submit their own name-value pairs and we will store them with the transfer. These name-value pairs can be queried upon using the ListTransferRecords method. The distributor should also include a DistributorRef that uniquely identifies the transfer within their system. What’s the purpose of “BatchItemRef” in the EstimatePrices method? Where can I find the transfer types? How can we see products and product updates? It is suggested to run getProducts daily. Depending on sale output and system performance it could be performed hourly or weekly. Automatic email system can be created client side to notify of product changes. How can I perform various test cases for UAT? While integrating with our API, your account will be in live mode by default. 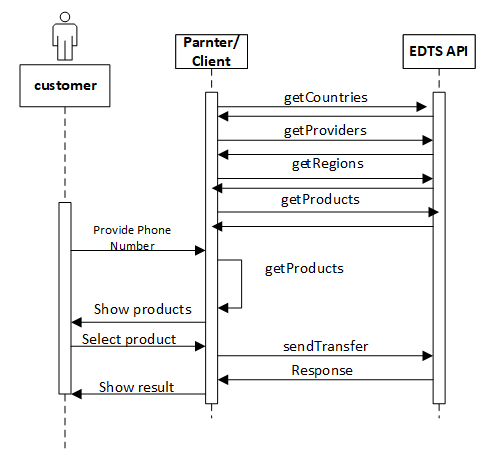 While in this mode, only test numbers will work with the SendTransfer API method. You can use Live numbers for all other methods. The success case number is available by calling the GetProducts method. It is listed as “UatNumber”. The other test numbers for the different cases can be assumed from the success number. The only difference is that the final digit of the number. As an example, for Digicel Jamaica, the UatNumber returned from GetProducts is 18760000000. Do I need to have balance for performing UAT? SendTransfer for UAT numbers would work with zero balance. You can fund your account using Self-Funding (Credit/debit Card or PayPal, if currency is supported) or by funding our bank account. You can contact our BD team for account details. What are the suggested flows? There are countless different means of consuming our API depending on your system and requirements, the below is just proposed suggestions. In this first recommendation your application will get all the information beforehand. 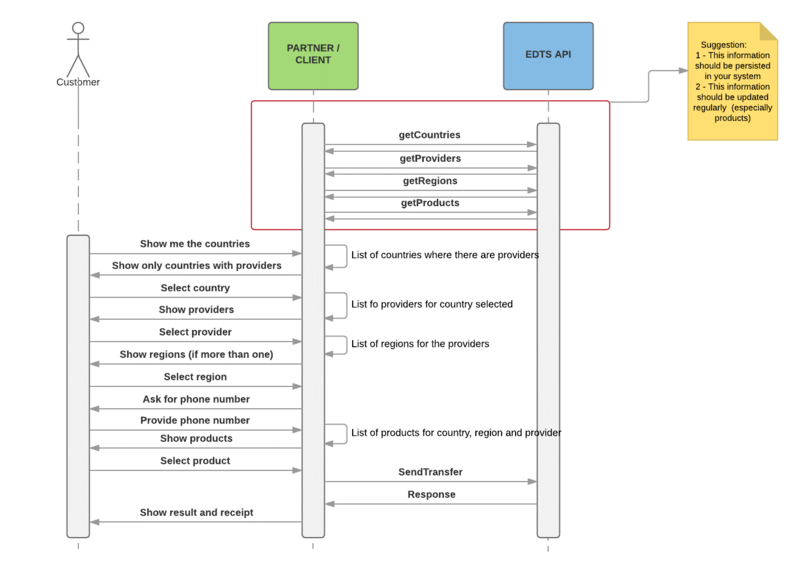 The main idea of this suggestion is that your system has minimal API calls during each transaction. The customer is expected to provide the necessary parameters needed to complete the transfer. In our second recommendation your application will use our lookup functionality to find out the products available to a given account number. The customer is expected to provide the account number upfront and from this your application should be able to show the products available. In our 3rd recommendation your application will use our getProduct functionality to find out what products the phone number maps to. The customer is expected to provide the account number upfront and from this your application should be able to show the products available. Who can I contact for help with API integration? We have an integration team. Please email partnersupport@ding.com to get in contact. Who should I contact with questions after integration? Contacting partnersupport@ding.com is the best option for further questions.